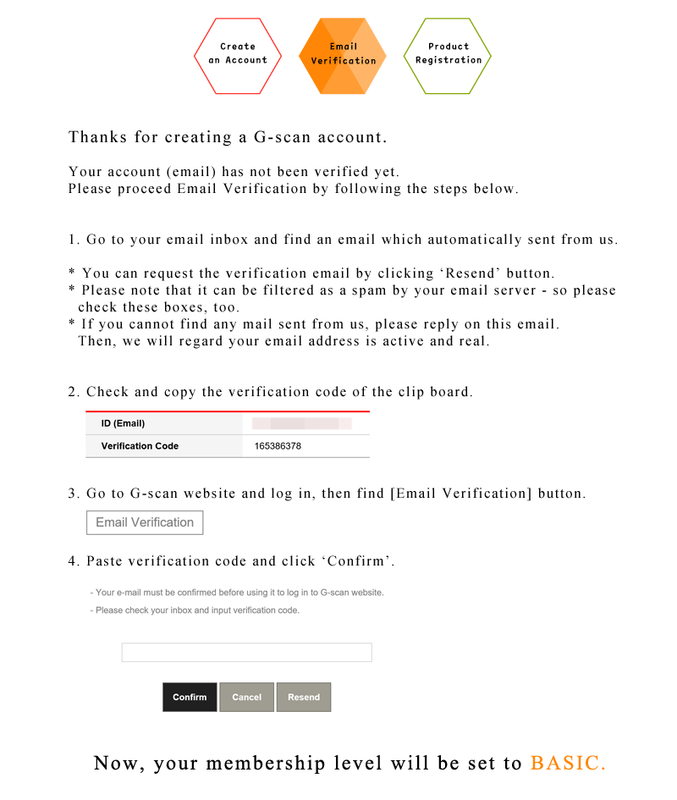 [ G-scan Account ] How can I verify my account (e-mail address) ? [ G-scan Account ] How can I register my G-scan / G-scan2? 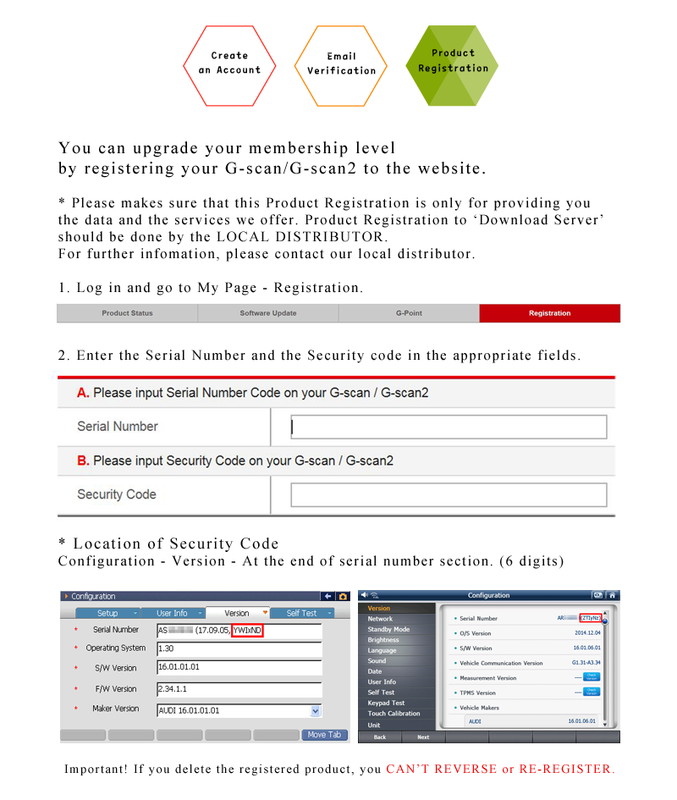 [ G-scan Account ] What is the best membership for me ? We offer three different types of membership to meet the needs of different customers. 1. Email Verification has been done. 2. Update period has expired. 2. Update period is valid. [ G-scan Account ] What is a G-scan account for ? A G-scan account is the personal account you use to access G-scan websites and services like tech Q&A board, forum, my page, downloads, and more. It includes the email address and password you use to sign in, as well as all the country, grade, and security details that you’ll use across G-scan products. [ General Inquiries ] What happens if my product is not registered on G-scan server ? Registration (By local distributor) is a process that adds the G-scans serial number to the Update Recipient List. Unregistered products will not be included in the list of valid recipient of the update files. If you attempt to update your G-scan with the update files without the registration, it may be considered as unauthorized update and G-Scan may stop working. Please ask your local distributor to register your product without delay not to experience unnecessary inconvenience. [ General Inquiries ] How can I register my G-scan on download server? Registration for download server should be done by your local distributor. Please contact your distributor to check if it is registered on our server properly. [ General Inquiries ] What is your warranty policy ? Basically, G-scan is warranted for one year with exceptions for rechargeable battery. A Li-ion battery is warrnated by the battery manufacturer for 6 months only and this is generally applied for all products. However, the length of warranty period and other details vary subject to local government regulations or price conditions, so please contact your distributor to check the actual warranty policy that is applied to your local market. [ Update and Support ] How can I update my G-scan? Update is provided three times a year by distributing the update files in various forms, such as DVD or Internet download. You can receive those update files from your local distributors in every January, May and October every year. Please check your distributor or our website’s new released notice for availability of new update. You MUST get the update files from your local distributor all the time because G-scan is "Region Sensitive". If you attempt to update your G-scan with update files that were not released for your country, it may be considered as unauthorized update and G-Scan may stop working. [ How to Buy ] Can I buy a G-scan from the other country or internet, and get supports from the local distributor in my country ? You can use G-scan, but you cannot get updates and support from your local distributor. As for update, you MUST get the update files from your original distributor all the time (please refer to the FAQ article about "How can I update my G-scan?") If you attempt to update your G-scan with the update files that were not released for the country that you originally purchased, it may be considered as unauthorized update and G-Scan may stop working. We strongly recommend you to purchase G-scan from the authorized distributor in your country. As for warranty service, please be advised that the distributor has the right to refuse servicing the products that he has not sold. [ Update and Support ] What should I do when G-scan is not working properly ? If it is communication problem, please go to Support > Feedback Form page of this website. We will support you by mobilizing the 24 hour support team if you provide us with the Data Log. If it is not a communication problem, please contact your distributor for possible service and further support. If you are not sure, please use our Tech Q&A page of this website or write us an email.